JADE guest Connor, bought a starting Warhammer 40k Tau army while on a trip to Scotland almost 10 years ago. 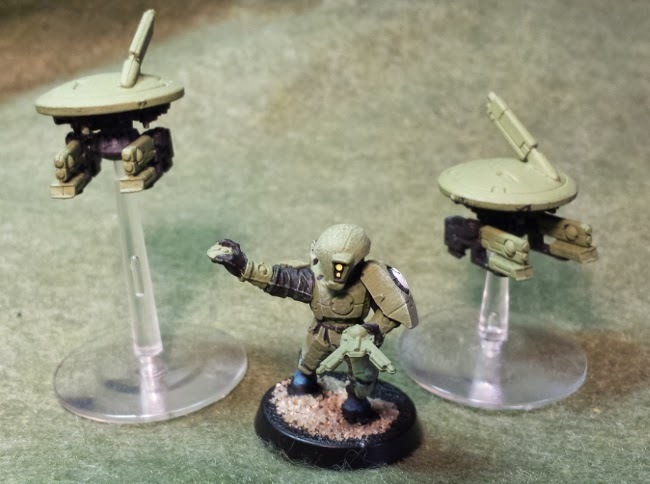 Two weeks ago, he finally got around to painting his first squad and playing his first couple of games. 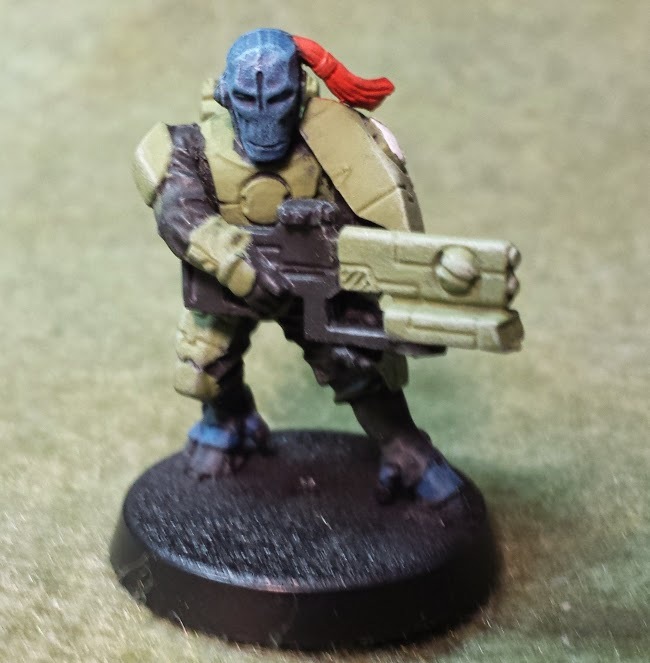 The hardest part for Connor was deciding what colour to paint his guys, and even after finishing a few in his final choice of green and black, he was considering as red colour scheme. I think he made the right decision. 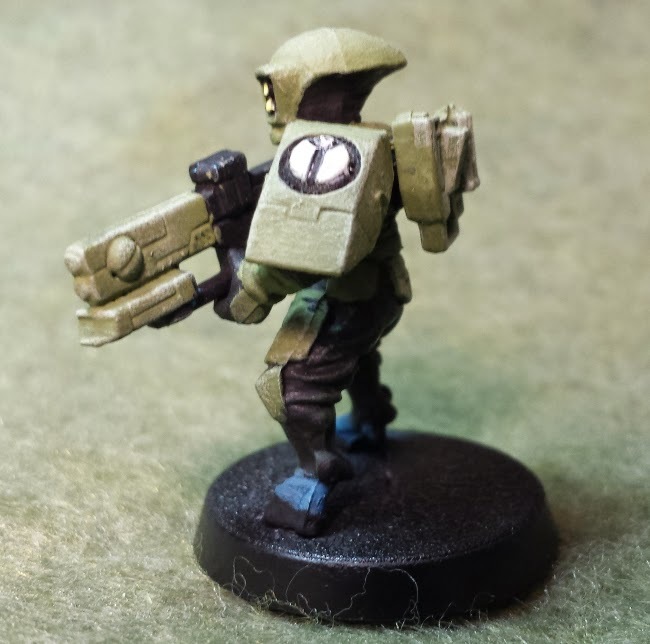 I had never fought against the Tau before, being a newer army, and with my 40k hay day being well more than a decade behind me. Of course, Connor had never fought with them either, so using the 6th ed rules we set out to fight our first battle. 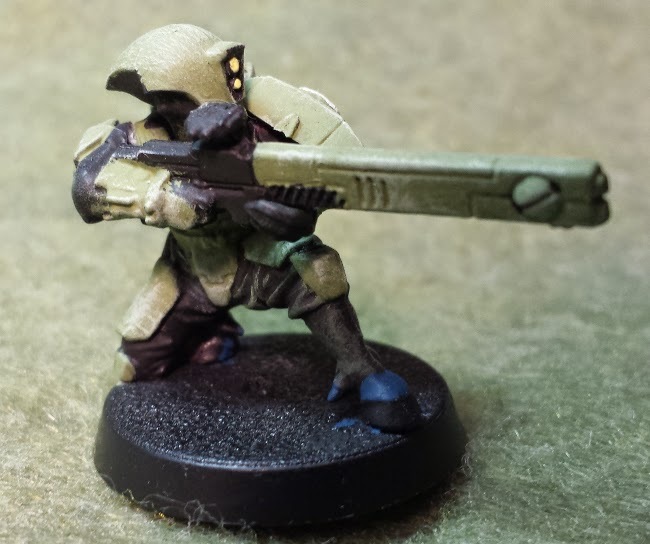 The Tau Fire Warriors are definitely long range specialists. Their guns are Strength:5 AP: 5, and Rapid Fire with a 36" range (or Assualt 18"). 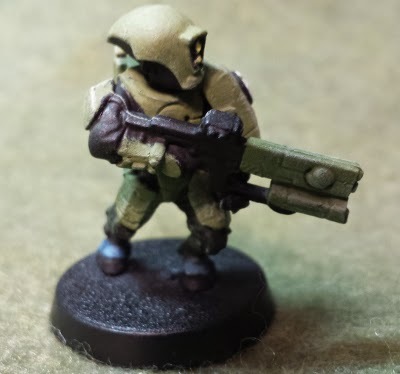 That 18" double shot makes a squad of Fire Warriors quite difficult to handle at a distance; being able to easily wound even the strongest unit. Lucky for me I was using my Plague Marines who have Toughness 5. It evened the odds a little bit. We had a great battle that went the full 7 turns of a Purge the Alien Mission. Our fight ended in a draw, with neither of us really able to get the upper hand. This was in part because I was being a little squeamish with my expensive Plague Marines around the Tau Guns. A mistake I corrected in our second game. All in all I was pretty impressed with the sheer volume of dice the Fire Warriors roll for each shot, which can be increased and modified using different HQ options. Definitely a cool army, but it certainly takes some practice and getting used to if you want to wield them as an effective force. Especially when dealing with Close Combat. All in all I like the Tau as an Army and look forward to fighting them again in the future, or maybe even giving them a try! 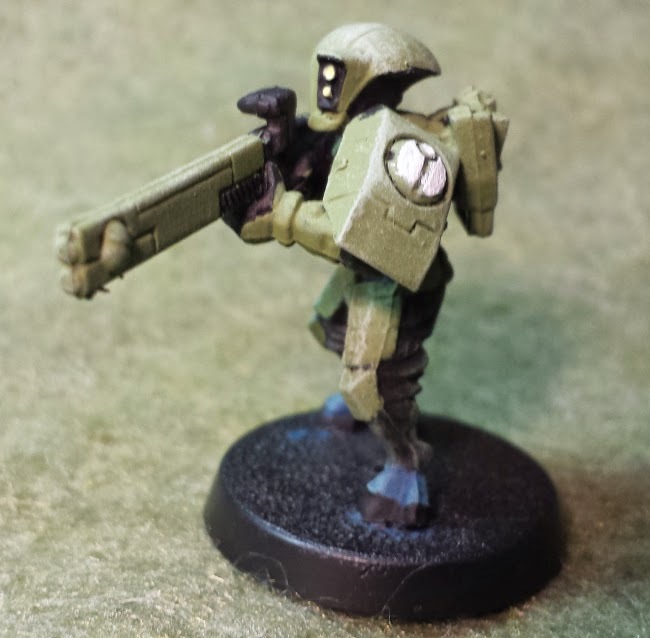 I also think Connor did a fantastic job on his first squad of Tau, and I can't wait to see more of them painted on the field!